The European Green Crab, also known as the European Shore Crab or Green Shore Crab, is a medium sized crab with three blunt spines between the eyes (rostrum) and five pointed spines either side of the eyes. Adult specimens range in colour from olive to dark green, often with yellow or orange patches underneath. In contrast, juveniles generally display a light sandy colour. 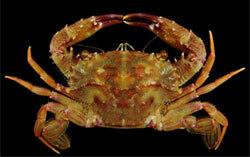 European Green Crabs have a broad triangular shaped shell averaging 5 to 6 cm in width but have been known to reach 9 cm. They do not have flattened swimming paddles on their rear legs. The European Green Crab is native to the Atlantic Coast of Europe and northern Africa. However, this species has spread internationally to North America, Japan, South Africa and Australia. 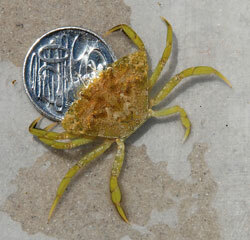 Records indicate that European Green Crabs were first documented in Australia in 1900 at Port Phillip Bay. It has since been found in Tasmania, Victoria, South Australia, Western Australia and New South Wales. In NSW there has been recent sightings of the crabs in Burrill Lake, Clyde River / Batemans Bay, Tomaga River, Candlagan Creek, Coila Lake, Lake Mummuga, Wagonga Inlet, Nangudga Lake, Corunna Lake, Tilba Tilba Lake, Merrica River, Wallaga Lake, Bermagui River, Cuttagee Lake, Wapengo Lake, Nelson Lagoon, Merimbula Lake, Pambula Lake, Twofold Bay (including Curalo Lagoon, Shadracks Creek, Nullica River, Towamba River / Kiah Inlet, Fisheries Creek), Wonboyn Lake and Nadgee Lake.The European Green Crab can live in a variety of habitats but is generally found close to the shore on mudflats or amongst rocks in protected bays and estuaries. What impacts do they have? 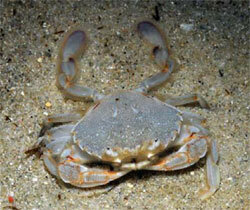 The European Green Crab has negatively impacted native species and aquaculture industries overseas. The species is a voracious predator that feeds on many types of organisms including shellfish and other crabs. European Green Crabs have the greatest potential to impact aquaculture when present in high densities. Limited numbers of NSW oyster farmers have reported suspected crab related oyster mortality. 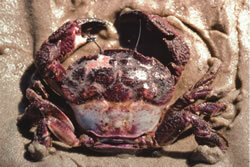 At present, it has not been confirmed that these mortalities are a result of European Green Crab predation. Other NSW oyster farmers have observed European Green Crabs in their oyster lease areas but have not seen impacts on production. Anecdotal reports suggest that regular handling of oyster gear may reduce the negative impact of European Green Crabs on oyster production. Routine inspection, grading and handling of oyster growing equipment and removal and correct disposal of suspected European Green Crabs from oyster gear is recommended to minimise the potential impact on cultured oysters. To date, no conclusive evidence has shown that European Green Crabs are affecting biodiversity in NSW. The European Green Crab is thought to have been originally introduced to Victoria in the late 1800s via dry ballast in wooden ships. Much of its subsequent spread has probably been by natural dispersal in oceanic currents. Other possible domestic dispersal mechanisms include spread by boats and ships or accidental transportation within oyster farming equipment and infrastructure. On the 1st July the NSW Government implemented the new Biosecurity Act 2015 (the Act). Under this new legislation the European Green Crab are declared a notifiable species in NSW under Part 2, Schedule 1 of the Biosecurity Regulation 2017 (the Regulation). Under Part 2, Division 5, Clause 18 of the Regulation it is illegal to possess, buy, sell or move this pest in NSW. Heavy penalties apply for non-compliance. Eradication of an introduced species is nearly impossible once they become established. With this in mind, DPI is endeavouring to gain a better understanding of the distribution, abundance and potential impacts of the European Green Crab throughout NSW. DPI developed a pest identification card for the European Green Crab that has been distributed to all oyster and mussel farmers as well as interested members of the public. This step has been taken to assist in identifying and differentiating between European Green Crab and similar native species. Additionally, oyster farmers have been asked to report any impacts upon production that they attribute to European Green Crab. DPI has given support to local groups interested in reducing the numbers of this pest crab in localised areas of the south-coast. This support included a trapping program that was completed during 2010-2011 by the Sapphire Coast Marine Discovery Centre and the former Southern Rivers Catchment Management Authority (with Commonwealth Caring for our Country funding and the assistance of volunteers). DPI continues to support projects that raise community awareness of European Green Crab as well as efforts that strive to determine if different types of oyster infrastructure are more effective in reducing crab presence. DPI in collaboration with researchers at Macquarie University and Batemans Marine Park (in partnership with former Southern Rivers Catchment Management Authority, now Local Land Services, and the Sapphire Coast Marine Discovery Centre) has undertaken a study investigating the biology and ecology of European Green Crabs in Coastal lakes of southern NSW. It is anticipated that the findings of this report will be available in the near future. 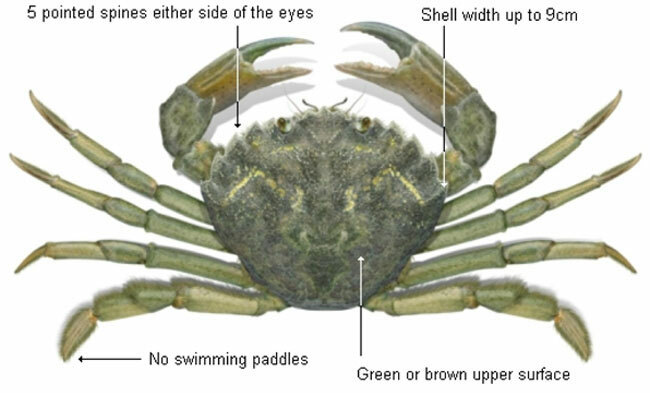 Learn to recognise, and be aware of, the European Green Crab so that you can report a suspected sighting in a new location to DPI Aquatic Biosecurity. Please take good quality photos or collect a sample (freeze crab in plastic bag) and contact DPI Aquatic Biosecurity, including a description of where it was found and GPS points or a map if possible. If you think you have visited an infested estuary, inspect your fishing and diving gear, boat and boat trailer. If you find any live crabs, please humanely dispatch and dispose of them in general waste away from the waterway. When diving, fishing, or working in the aquatic environment, keep a look out for new introduced marine species. Click here to report any suspected new sightings or call the 24 hour recorded hotline: 02 4916 3877 or email aquatic.pests@dpi.nsw.gov.au.